Home » Website Building » SEO » How to Set Geo Targeting in Bing Webmaster Tools? 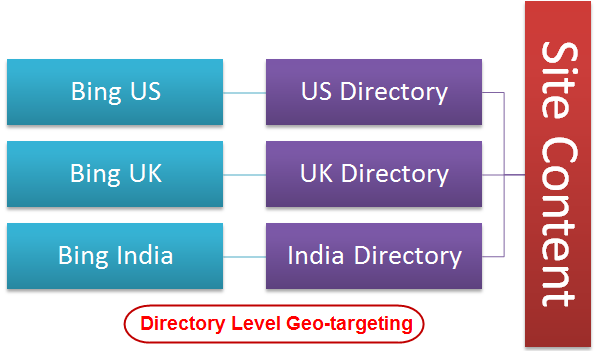 Geographic target setting helps webmasters to inform Bing search engine about the targeted audience of their site. For example the owner of a website having a real estate agency in United States will be more interested in showing his site top in US or a site having content in French is to be shown top in France rather than US. As the search results are shown different in different countries, search engines consider Geo targeting as one of the factors before showing a country specific results. 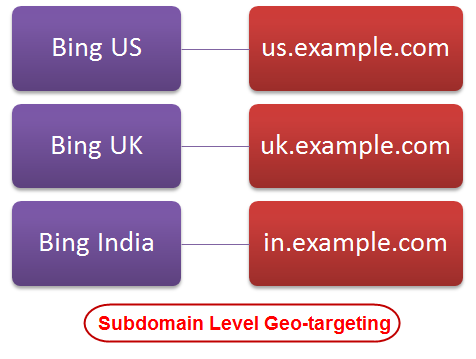 Bing webmaster tools offers a geo targeting option for webmasters to connect a geographic country location to their site. Bing provides more flexibility to link even every single page in your site with different country. This option is very useful if you have a common content with multiple landing pages. For example, a webmaster can have site hosted in India but have three landing pages for India, US and UK. Directory level geographic setting allows webmasters to link countries at directory level and all the pages under the specified directory will be linked to the selected country. For example if your site has a dedicated directory for US say http://www.example.com/unitedstates/ this option allows you to set US as geographic setting only for this particular directory. This option allows you set the country setting at subdomain level. If you maintain your site with country specific subdomains this is a wonderful way to link your subdomains and the corresponding countries in the geo targeting. This is a most simple option allows webmasters to set geo-target at the domain level to a desired country. This option will be available in webmaster tools account only for the geo targetable top level domains like .com, .org or .net. For most of the country code top level domain (ccTLD) like .us or .ca will not have this option to set a geo targeting at the domain level since ccTLD itself has a country linked to it. Still webmasters can set a geographic setting at directory or page level. How to Set a Geographic Target? Login to your Bing webmaster tools account and select the site you want to set a geo target. The site must have been added and verified in your account in order to use this feature. Go to “Geo-targeting” option available under “Configure My Sites” tab. From the drop-down select the URL type you want to geo-target as explained in the above section. Enter the URL in the box and click on Submit button. Once submitted the list of URLs will appear in the page along with type and country information. You can change or delete the geo targeting any point of time later. Geo targeting is generally meant for the generic top level domain like .com where the country code is not linked with the domain. In case of country code level domain like .us the site is already linked with the corresponding country. 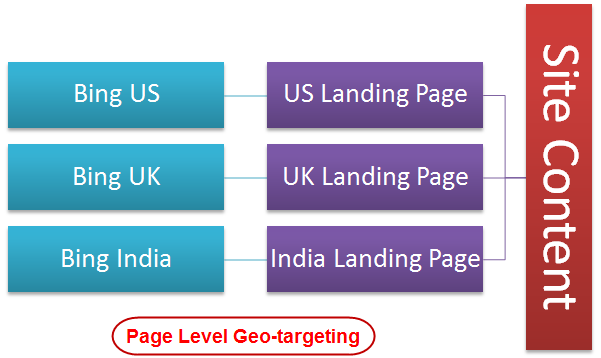 If your site is targeting global audience then it is recommended not to use the geo targeting option even if your site is created with specific language. Geo targeting will influence the search results of global as well as the local country you selected.